The Password Protect Directories function allows you to require a username and password to access a folder or folders from the web. This is very useful when you need to limit access to a certain part of your site. 1. 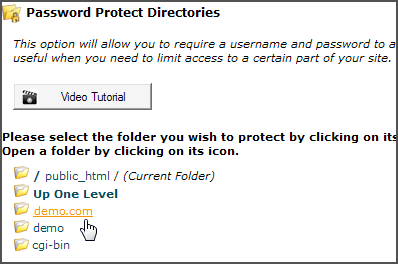 Click the Password Protect Directories icon under Security. 2. Select the folder you wish to protect. 3. Select the check box to protect this directory with a password. 4. Enter a name for this protected directory. 5. Click on the Save button to continue. 6. The directory is now protected and requires a password to enter it via the web browser. We must therefore create at least one user and assign them a password to access the directory. 7. Click the Go Back Link. 8. Enter a username and password. 9. Click on the Add/modify authorized user button to continue. 10. The protected directory now has one user who has access to it. Repeat this process for each additional user you want to grant access for.